This week’s Stock of the Week is looking to the world’s growing need for aircraft and the increasingly complex technologies they require. Honeywell International Inc. (HON) is counting on growing worldwide demand for aircraft—especially in Asia—to boost demand for equipment, software and services from its aerospace unit over the next several years. The offerings from the aerospace business, which generated about 37% of the company’s $39 billion in revenue last year and has had an impressive rebound in earnings and revenue this year, range from inflight Wi-Fi technology to airplane brakes. It has seen a strong rebound this year. Activist investor Dan Loeb has pushed for spinning off the aerospace business, but Honeywell has been studying whether that or a different type of breakup would be wise. Revenue should grow to $41.2 billion in 2018. Honeywell also has a home-and-building technology unit, which has been doing well, plus a performance materials unit and a safety and productivity business. Honeywell should do well either in current form or in a breakup. Its dividend of $2.66/share/yr. 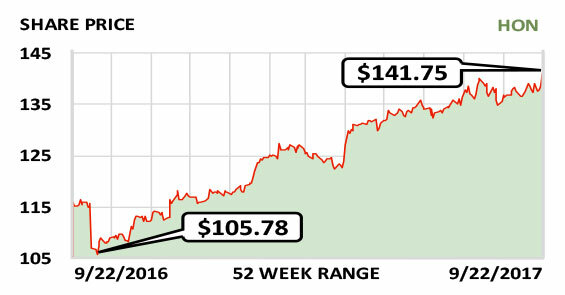 recently yielded 1.9% and has grown at a compound 12% rate over the past five years. Fiscal year: December. Earnings per share: 2018 est./$7.77…2017 est./$7.09…2016/$6.60.